Here's the third installment of this series. I am so fascinated by this material that I didn't have a word limit for the other two posts. I'm sorry to those who're saturated with bamboo but I didnt want to leave any strings loose in the air, so to speak. 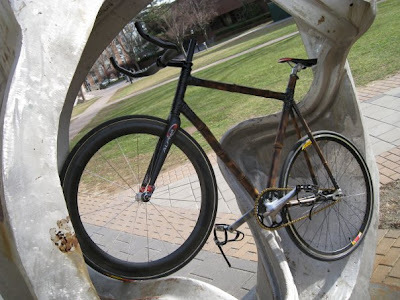 If you read Part 2, you may have noticed the unanswered questions on Nick Frey's Bamboo bike that I said might sooner or later be revealed. In this post, Nick replies to them so we can get an idea of what his ideas are and where he's going to go with them. For me, it was a good learning process and I was quite appreciative of the fact that he spent some time out of his training and school to detail the building process with me. A quick recap : Nick Frey is a mechanical engineering junior at Princeton University. He's also Espoir National Time Trial champion. 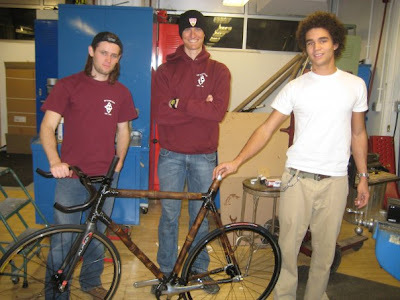 He and friends teamed up to build a practical wooden road racing bike for a design project at school. They went from one to two and now three bicycles, at each step rectifying mistakes and learning more about the material and the process. Perfecting the art has been their goal throughout. 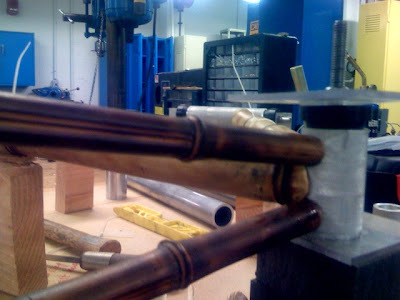 Most importantly, their idea has culminated in a venture to start a company specializing in bamboo bicycles. Me : So was this master plan part of a senior project or just time pass..? Where did the idea to form a company pop up from? Nick : It was our design project for MAE 321: Engineering Design. Our inspiration was Calfee, but the idea for the company basically evolved from our love of thinking about and building these bikes and the fact that Calfee's are so overpriced and no one else makes them. Me : The propane torching for the bamboo is totally new? I mean, are you looking to patent it? That'd be cool. 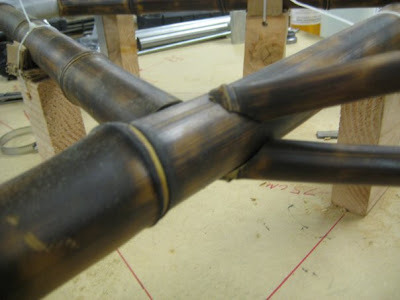 Whats cutting tools do you use for bamboo (just saws?) and are you also employing any jigs for torching, assembly etc? Nick : Propane torching is not new, it is how many suppliers "mottle" the tubes to look cool. However, we torch GREEN bamboo, just after being cut, while suppliers torch bamboo that has already been air dried, so theirs split quite often while ours are sealed by the heat and much stronger. I don't think we will patent anything because of IP problems with Princeton, and because most things in the bike industry do not depend on patents but rather advertising, name, pedigree, and reviews. We use a special cutting tool in our milling machine that is meant for nice mitered cuts in wood even against the grain and on holes with close centers. We have the EXACT size needed for both the BB and head tube, so one cut and some quick trimming with a Dremel and VOILA! Me : Who supplied you with the oven and bamboo raw material for the pilot project? Nick : We cut down our own because the stuff we were getting from Brazil was taking forever. We have actually realized that local stuff is the best! It has the right diameter, and there is a TON of variety for wall-thickness, nodal density, shape, etc. Also, we can cut it and treat it immediately, a key to preventing splitting and making it strong. 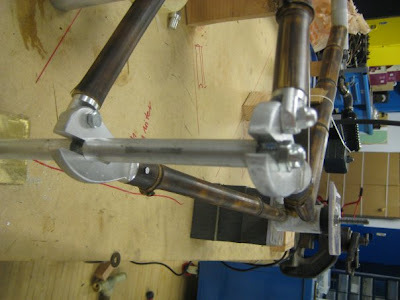 Nick : Model Zero took a LONG time, but our third model is taking far less time (most of it was making the jig and creating/CNC'ing the dropouts). The time needed for cutting and treating the bamboo is about 1.5 hours, bake overnight, then mitering a whole bike takes another 1.5 hours to get it perfect, then making the dropouts (just run the CNC machine while mitering) and making a little seattube sleeve for the seatpost and clamp adds another 0.5 hours, then wrapping the joints takes about 1 hour. Let it sit overnight, maybe do another wrapping layer and get it cosmetically perfect, spray-paint our name and whatever else, apply tung oil, and the whole thing takes about 5-6 hours. We have been really taking a lot of time with mine because I want it to be PERFECT and am going to race on it and use it as a show-bike, and with squeezing in a couple hours every couple days due to training and school it has taken a while. However, once the company is up and running, one person can definitely make a complete, finished frame in one day of work. Nick : He is getting an operation setup in Nigeria (born there, works closely with the national university there) and we should be making bikes by the summer! The cool part about this operation is the low investment in capital costs. The CNC'ing is outsourced easily, and then all we need is a small mill and lathe, and a Dremel, and we are golden. At this point, advertising and getting a shop in Boulder, CO to use as a nice showroom will be the majority of our cost, and that will not occur until after graduation when we have hopefully built a name for ourselves. Me : Lastly, how do you ensure straightness in your tubes? Bamboo is all natural. Model Zero's down tube has a little angle 1/4th of the way from head tube (at least looks to me). I suppose you'll selectively pick your tubing then ? Nick : Straightness is desirable in most tubes, but the seatstays are actually curved, and the seattube and chainstays are ovalized. Mostly it doesn't matter if there is some bend, we oriented the tube that way because it looks cool. To be honest, the stuff is WAY stronger than any carbon or aluminum (it weighs a little more, but won't shatter when you lay it down!) and having a little bend in it just looks cool and makes each frame unique. We could throw out any tube that isn't perfectly straight, but we prefer to incorporate a bend like that into each frame design (like the seattube on my race bike curves from the BB shell around the rear wheel a little bit!). Thank you for reading. I wish Nick and team the best of luck. I'm sure its a challenge juggling school with competition and now frame building. But I like to call problems challenges, they're never problems! I'm sure you must have been following up on the North American Hand Made Bicycle Show. For those who haven't, be sure to check out the Cyclelicious Bicycle Blog for some good reports. Bike Radar has some closeups of some of the bicycles. Also check out the Bike Forest Blog for awards news. 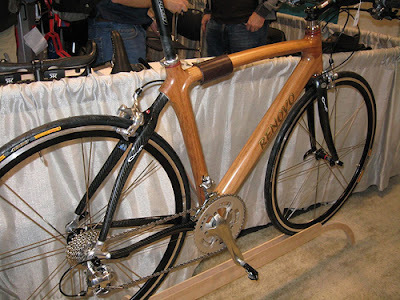 Here's a sweet picture from Cyclelicious, if its not straying too much away from our wooden bike theme. 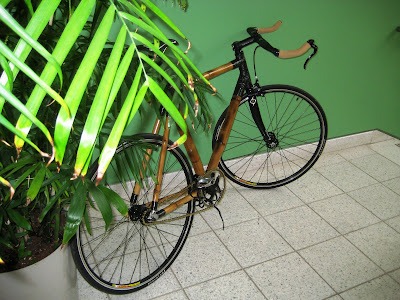 I have seen bamboo bikes around before. They are interesting to me because they are a natural material. It will be interesting to see how successful these guys are. If you get your hands on one, feel free to share your experience. Try to rate Lignin% in Bamboo, then contact “Dr. Cheu-Ching FOUN” for further discussing Bamboo mechanical force. The mechanical function of Lignin in Coconut husk vs. Wood (Bamboo Lignin? )has been released to two female students before the begining of 2010 at the front of Department of Forestry and Resources Conservation, NTU.